ORLANDO, Fla. - Central Florida will get a taste of fall -- at least by Sunshine State standards -- with overnight lows reaching the 50s early Saturday in some parts of the region. The high Friday in Orlando will be 90. The average high on this date is 86. Changes, however, are on the way. "A weak frontal boundary will slide through the state, ushering in some nice changes for Central Florida," News 6 meteorologist Candace Campos said. "A drier and slightly cooler northerly wind flow, combined with mostly clear skies overnight will allow low temperatures to fall below 90 degrees for the first time in a long while." Models shows lows ranging from the upper 50s in Marion County to the low 70s in Brevard County. 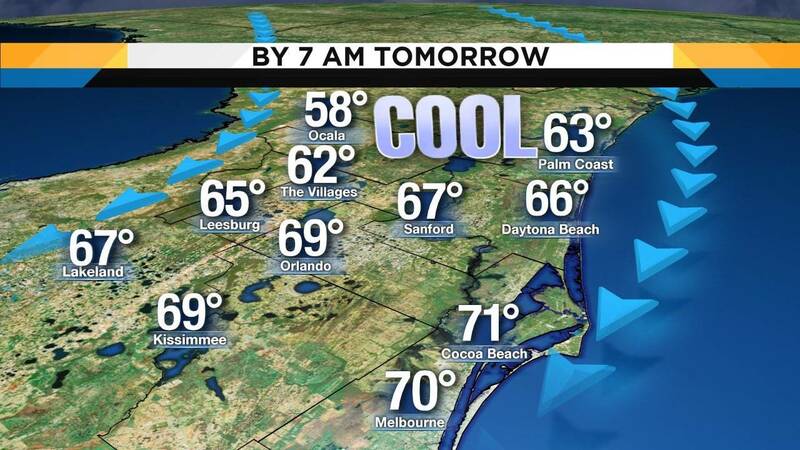 Orlando will see lows in the 60s, the coolest temperatures in The City Beautiful since May 11. "Any small chance of an isolated shower would be confined to the far south coast as some rain could linger," Campos said. High pressure will build in Saturday afternoon, allowing for a nice seasonal weekend ahead. "Plenty of dry air will remain in place, which is why rain chances will be minimal through Sunday," Campos said. Highs in the Orlando area will be near 88 from Saturday through Monday, but it won't be as humid. Humidity and warmer temperatures will return next week, with lows into the mid-70s and highs near 90 degrees starting on Tuesday. What was once Hurricane Michael is nothing, in fact, the National Hurricane Center doesn’t even list the storm on its website anymore. What we are now watching in the tropics is a broad area of low pressure that could form over the Western Central Caribbean Sea in a day or two and then move slowly westward toward Central America through early next week. Development of this system is no longer anticipated. That’s why the hurricane center is giving it a 0 percent chance of development within the next two days and a 0 percent chance of development within the next five if it does try to do anything, which it won’t, it would move to the Yucatán with just a couple showers. Hurricane Leslie is moving over to Europe eventually. Right now it’s a Category One hurricane with winds at 85 mph. Tropical storm Nadine has maximum winds at 45 mph and will die before it reaches the lesser Antilles. This cold front in Central Florida is not one that will bring drastic changes and our dry season. Keep in mind usually that strong front, the first one of the year, comes in around Oct. 15. We will wait to see when the next major front comes in to bring in the dry season. Expect rain chances to return to 40 percent by Monday, just showing that the dry season is not here yet. Watch News 6 for more weather updates.